As outlined in my 2006 campaign for Governor, the most important issues we listed were Universal Health Care, Quality Education, Effective Transportation, Sustainable Energy, and Environmental Protection. Viewed generally as outside the scope of state policy setting, I refrained from addressing Peace issues in our broad policy objectives. However, I subsequently have added Peace as a policy priority with links to my public commentaries on the subject. Below is a general philosophy on each issue. Throughout my long legislative career, I have met with and listened to residents from all over Minnesota to include your perspectives as I develop policy. I invite you to send me your comments, your complaints---and your aspirations and dreams for yourself and for Minnesota during this campaign. In the coming weeks, we will develop position papers on all the issues listed below. If you have resources or information you would like to share with the campaign, do not hesitate to contact my Policy Director, Kavi Turnbull. We want to hear from you. It's only with your involvement and passion we will be able to achieve and fulfill Minnesota's promise and vision for a brighter future. The foundation for my platform is a belief that Minnesota's government can and should deliver quality services in a responsive, efficient and cost effective way, utilizing private partnerships to supplement but not supplant, Minnesota's basic commitment to supporting strong urban, suburban, and rural communities. Every Minnesotan has the basic human right to access health care that is affordable. Not only is the lack of access to affordable health care a commentary on what we value as human beings, but the soaring costs of health care are crippling Minnesota's businesses in the global marketplace. Further, small business people and entrepreneurs, are weighed down and discouraged by the high cost of independent health care. The cost of under and uninsured people is increasing costs for everyone else. Publicity press conferences and law suits will not resolve the problem it will take a consensus to a multistage process based on the fundamental acknowledgement that every single Minnesotan needs, deserves, and should receive quality basic health care. Under my leadership, no one will be left out of this most critical vision. A commitment to universal health care is my top priority as Governor. Universal quality education is the foundation of a free society. The quality of education must not be determined by where in the state a child is born. As a State we have a constitutional and moral obligation to ensure that the resources are available to ensure every family has the education they need to succeed. Shifting the financial burden to property taxes has been a disastrous mistake. As Minnesota's Governor I will renew the “Minnesota Miracle” and ensure that education – from early childhood to high school to continuing and higher education – is made available to every Minnesotan. Not only is education the most important tool to develop our current and future economy – education is the incubator of dreams. To educate all our citizens to fulfill their highest potential IS to fulfill Minnesota's dream and further America's democracy. An effective transportation system is essential to a competitive economy. Moving people efficiently to jobs and products to market is one of the most important investments government can make in ensuring competitiveness. An effective transportation system includes roads, airports, highways, and public transportation – including buses, and light and heavy rail. Every citizen has the right to access transportation that is safe, efficient, and economical. Under my leadership, we will not only expedite improvements to transportation infrastructure, but we will prioritize projects that reduce and prevent pollution, including the development of biofuels grown from Minnesota's crops. Minnesota businesses and workers will gain a significant competitive edge when we reduce Minnesota's dependency on imported fuels and invest in clean, renewable energy. Under my leadership, we will prioritize development in Minnesota's clean energy sources like wind, solar, geothermal and biofuels – jumpstarting our economy and creating jobs – as well as eliminating the pollution that compromises our air and water and makes us sick. Minnesota can and must become an international leader in clean, renewable energy. Clean air to breathe, clean water to drink, and natural habitat for recreation and renewal are all part of Minnesota's birthright. As a farmer and hunter, I know that while these things are an essential part of our economy, they are also an integral part of our quality of life. Our inheritance to our grandchildren is not measured in dollars and cents, but in the condition of what we leave behind. Under my leadership, a commitment to sound environmental policy will not simply be a slogan, but will be turned into action that restores our air, our water, and our habitat into a healthy and sustainable state. Democracy Now! 8/22/2005 with Amy Goodman - Sitting in at Camp Casey in Texas for Cindy Sheehan who had to leave to attend to her ailing mother, Becky joins many others to decry the Bush Administration's war policy in the Middle East. Democracy Now! 8/19/2005 with Amy Goodman - Becky Lourey visits Camp Casey with Cindy Sheehan, offering recollections of her son Matt who died in Iraq, her earlier confrontation with Donald Rumsfeld, and explaining why the U.S. would be safer by ending the occupation of Iraq. Democracy Now! 5/6/2005 with Amy Goodman - Two weeks after losing her son Matt whose helicopter went down in Iraq, Becky talks lovingly and at length about her son, and her earlier activities in the Minnesota Senate opposing going to war in Iraq. Minnesota Senate 3/6/2003 - Seven minutes into this audio of the Senate floor session, a discussion of whether or not Senator Lourey would be allowed to read and debate her petition opposing the imminent, unilateral act of war against Iraq was ruled out of order by her colleagues and the Senate President. As though it had never existed, no reference to the petition was printed in the Senate Journal. 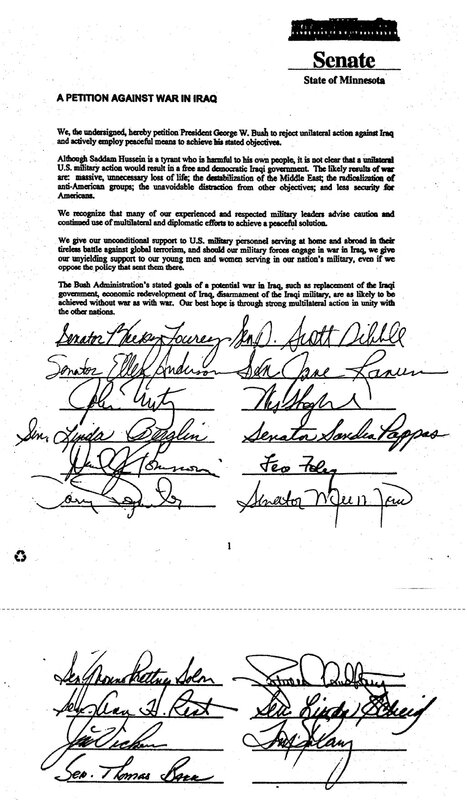 A copy of the petition, complete with 19 signatures of Senators in agreement with its content, is attached below.